This month for our Virtual Book Club for Kids we are spotlighting books by Dr. Seuss!! I think Dr. Seuss is fun and I especially enjoy reading his books to my kids. One of the books that we LOVE is One Fish Two Fish Red Fish Blue Fish. Usually we like to play ring around the gak or we drink pink ink when we read the book... but this week my kids wanted to focus on the first part of the book where they do some counting! We decided to practice counting numbers and talking about numbers this week after we read One Fish Two Fish Red Fish Blue Fish and the kids had a blast playing a number pocket game! Stick your pockets on the wall using painter's tape. Add the numbers to the outside of each pocket. You can use my free circle printable (or my number fish printable) and a 2.5 inch craft punch to make your circles super quickly or just cut them out with scissors. 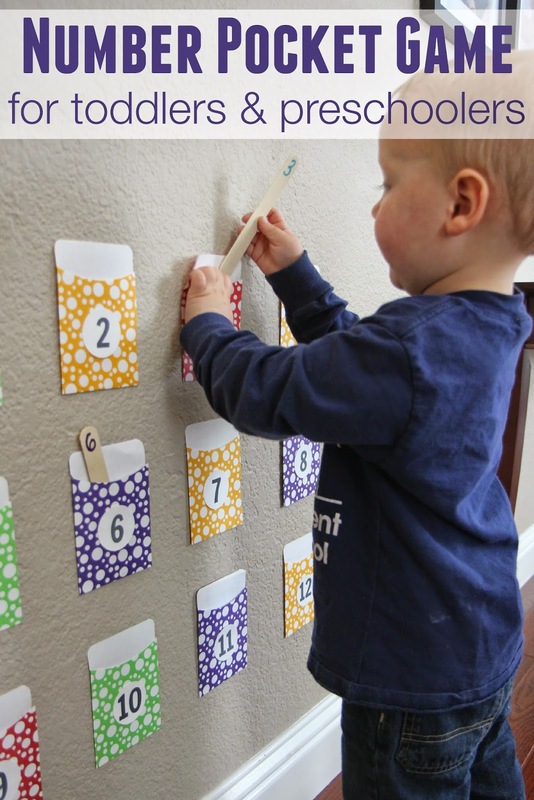 Once your craft sticks and pockets are ready, encourage your child to pick up a stick, look at the number, and then match it to the number on the wall. This is a seriously awesome visual discrimation exercise since most toddlers can't recognize their alphabet letters or numbers, but some can match shapes or designs they see... like written numbers. I didn't expect much from my 2-year-old but I was pleasantly surprised. He was determined to do it "all by myself" and copied his older sister and was able to match both of the envelopes. My preschooler joined in to work on simple number recognition and matching too. Next time we do this I'm going to need to figure out a way that we can in some addition or counting up for her since the number recognition piece was too simple. Once kids finished matching all of the sticks then they gave another person a turn. It was neat to see how well they cooperated and took turns doing this activity. Have you ever read One Fish Two Fish Red Fish Blue Fish or any other books by Dr. Seuss? We love them! Here are some other fun Dr. Seuss ideas shared by our Virtual Book Club for Kids co-hosts! Also, make sure you head on over to our Virtual Book Club Facebook page to check out the other activities that will be shared today. I love it! The pockets are versatile for so many things! For your preschooler put dots on the sticks to match with the corresponding number! Where did you purchase the pockets? I love the colors and pattern! I purchased them at Joann's Fabrics. I think they also have them at Michaels or any teacher supply store. Love this idea! Thanks. I think as an extension we might try working on matching quantities. Like maybe using pipe cleaners and putting five of them in the five pocket. What a great idea! Love it! Thank you! Love this! For my oldest, I may write a simple addition problem on the Popsicle stick; 1+3= and have him put it in the correct envelope! Thanks for sharing!!! How did he not tear the pockets? He was so excited to put things in the pockets and take them out of the pockets that tearing them never crossed his mind.